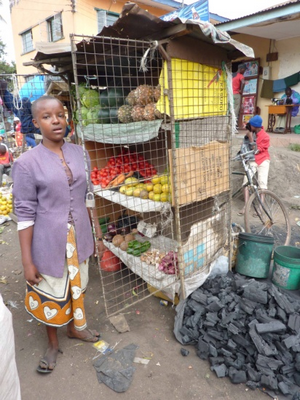 Joyce is just 16 and she and her grandmother Rose (59) have worked together to improve their lives. Joyce was given a grant in May 2011. She used this money to buy a goat. When she sold the first baby goat she used the money to pay her school fees for the year. In March 2012 Rose was given a loan of so she could start her own business selling crockery. They now have 3 goats, having sold another baby goat for school fees and expenses for this year. Rose has 10 dependants including 3 daughters who earn small amounts of money doing laundry, digging, cutting grass, etc, and 6 grandchildren. Rose says the whole family is eating better with what she earns and contributions from her daughters. Joyce and Rose are pleased with their businesses though admit that in the low season life can still become a little difficult. Rose would like to apply for a further loan so that she can sell used clothes. If you would like to help support more women like Joyce, we are currently raising funds for our next round of grants and loans. To help us achieve our target you can donate here.